Enter DNS name or IP address of the backup server you want to connect. Specify the server role — Veeam Backup & Replication server or Veeam Backup Enterprise Manager. 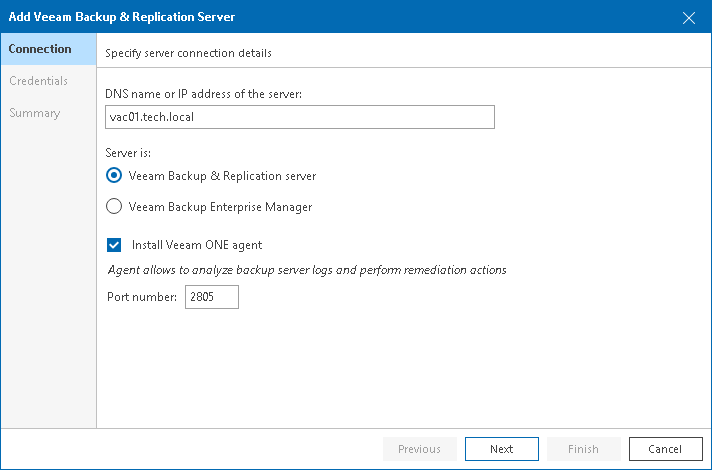 If you choose to add Veeam Backup Enterprise Manager, Veeam ONE will automatically connect all Veeam Backup & Replication servers added to the Veeam Backup Enterprise Manager. If you do not want to install Veeam ONE agent on Veeam Backup & Replication server, deselect the Install Veeam ONE Agent check box. You can also change the port number if required. By default, port 2805 is used for communication with Veeam Backup & Replication server. For details on Veeam ONE agent role and modes, see Veeam ONE Architecture.